I would love to start my own family in the future, since family is the most important thing in the world for me. I hope to maintain close ties with my parents and my siblings as we grow older as well. 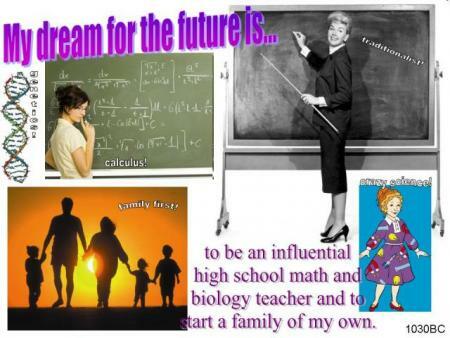 In addition to a family, I would also like to be a successful and influential high school teacher. I hope to inspire a love of math and biology in my students and help them to appreciate and enjoy the wonders that these subjects can reveal. Calculus and genetics are beautiful things!